Our J Hook Bolt Comes With A Corresponding Hex Nut For Roofing Sheets And Other Purposes. We take great pride in our wide range of DIY hardware repair and industrial tools that we stock here at SecureFix Direct. Our range of J hook bolts can be used for a variety of reasons, although they are typically used for fixing corrugated sheets onto roofs. We supply only the highest quality of J hook bolts and they make a great alternative to roofing nails as they are easy to replace tiles if future renovations are required. When it comes to DIY hardware repair and industrial tools there is no need to look anywhere else as not only do we stock the best items we have the most competitive prices. Each and every one of our J hook Bolts are plated with bright zinc to aid against rust and corrosion, and each one comes complete with a hexagon nut per bolt. 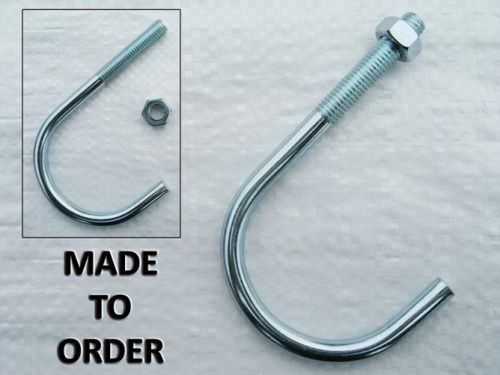 Our J hook bolts are completely made to order here at SecureFix Direct. To ensure you get the right specifications for your needs, a member of our friendly team will be more than happy to help. As the J hook bolts we stock here are made to order in the UK, please contact us for prices. As all of our J hook bolts are made to fit your requirements they can take up to 3-4 days to make, but we aim to dispatch your order as soon as possible. If you are in need of DIY hardware repair and industrial tools, then look to us here at SecureFix direct. Our high quality items are ideal for a variety of uses and they will be able to assist you with any projects. If you would like any information or wish to order our J hook bolts, please do not hesitate to contact a member of our team today. We will be more than happy to assist you with your purchase.